The patented TorqLoc hollow mounting system is an alternative to conventional connection techniques such as keys or shrink discs. The user not only benefits from straightforward installation and the possibility of safe disassemble even after many hours of operation, but also from a reduction in machining cost because the customer’s shaft can be produced using drawn, unprocessed material. Optional for parallel shaft helical, helical-bevel and helical-worm gear units. 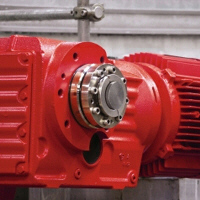 The TorqLOC® hollow shaft mounting system is used for achieving a keyless connection between the customer’s shaft and the hollow shaft in the gear unit. As a result, the TorqLOC® hollow shaft mounting system is an alternative to the existing hollow shafts with either shrink disk, key, or splines. The TorqLOC® hollow shaft mounting system saves costs, as well as provides the advantages of easy installation and removal. Purchase your SEW Eurodrive TorqLoc Helical Gear Units today!